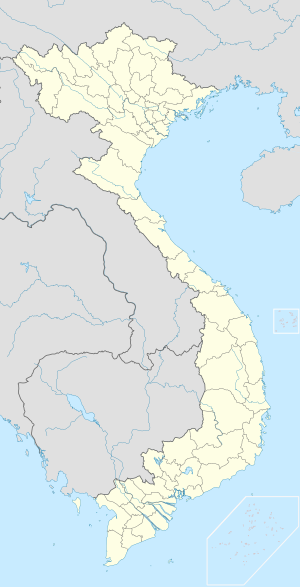 Bồng Sơn is a town (thị trấn) in the South Central Coast region of Vietnam. It is the administrative centre of Hoài Nhơn District in the north of Bình Định Province. It is 84km north of the provincial capital Quy Nhơn and 20km south of Quảng Ngãi Province. Bong Son is located in Bình Định's northern lowlands near Lai Giang River. It lies around 18km (road distance) west of the South China Sea coast. Bong Son is located along National Route 1A, Vietnam's most important road. Intersections with Road 630 and Road 629 leading up to Hoài Ân District and An Lão District are within a few kilometres of the town. The town has two post offices, one central plaza, and a stadium for cultural and sports events. Over 60% of households have been provided with clean running water. The town maintains 47km of roads and streets, averaging between 8 to 12 meters in width. According to historian Đào Duy Anh, Bồng Sơn was set up under king Lê Thánh Tông in 1471. It later became one of three administrative centres in what is now Bình Định Province. Bồng Sơn was the site of an uprising against French colonialism in 1945, involving around 8000 people and led by Trịnh Hồng Kỳ. As much of Bình Định Province, it was the site of severe fighting during the Vietnam War and a major battle in 1966. Bồng Sơn has a small industrial park (Cụm công nghiệp Bồng Sơn) with industries such as wood processing. ^ "Thị trấn Bồng Sơn: Hướng đến đô thị văn minh, thân thiện" [Bong Son town: Towards urban civilization, with amenities]. Bình Định Online (in Vietnamese). 29 August 2017. Archived from the original on 20 March 2018. ^ a b "Bồng Sơn: Hiện dần vóc dáng đô thị bên sông Lại" [Bong Son: Gradually taking urban shape by the river]. Bình Định Online. 18 March 2015. Archived from the original on 20 March 2018. ^ a b c "Bồng Sơn, lửa và hoa". Báo Bình Định. 31 August 2012. Retrieved 1 January 2013.